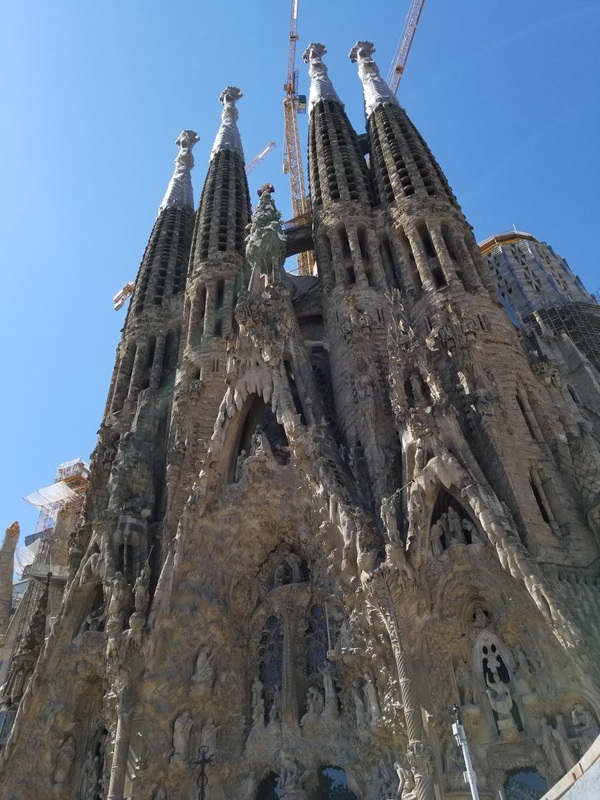 In August, I was in Barcelona for a day. Yup, you read that right -- just for one day. I was on a cruise and we stopped here. I did my homework, and I knew the best sights to see for a 10 hour visit. 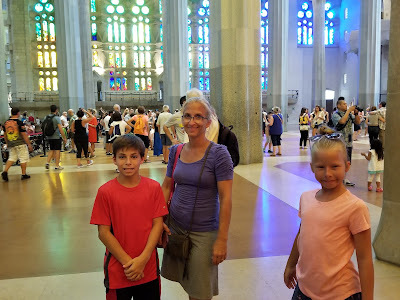 Familia Sagrada cathedral was on that list. 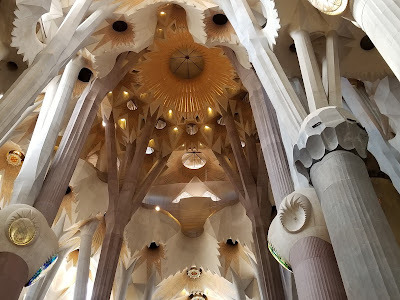 For those of you unfamiliar, this is a masterful modern creation of Antonin Gaudi. 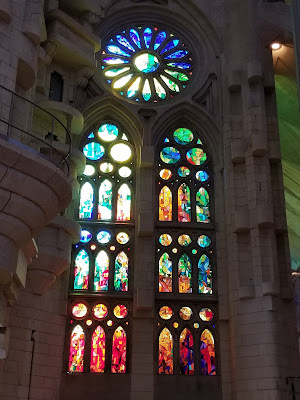 It is so far outside of the realm of anything I have seen in a church, that it's hard to describe without just allowing the pictures to do the talking. First off, as the photo suggests, this cathedral is still under construction. It is not 3-400 years old as many churches in Europe are. It was started last century sometime. 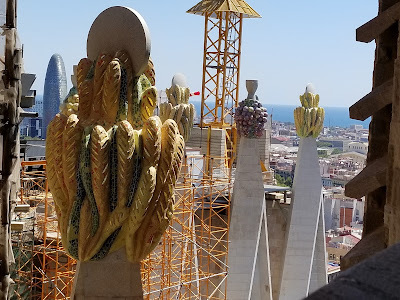 Barcelona is still trying to finish its construction to the specifications that Gaudi designed it for. When modern art has been poo-pood by some cities in Europe, Barcelona has embraced it. 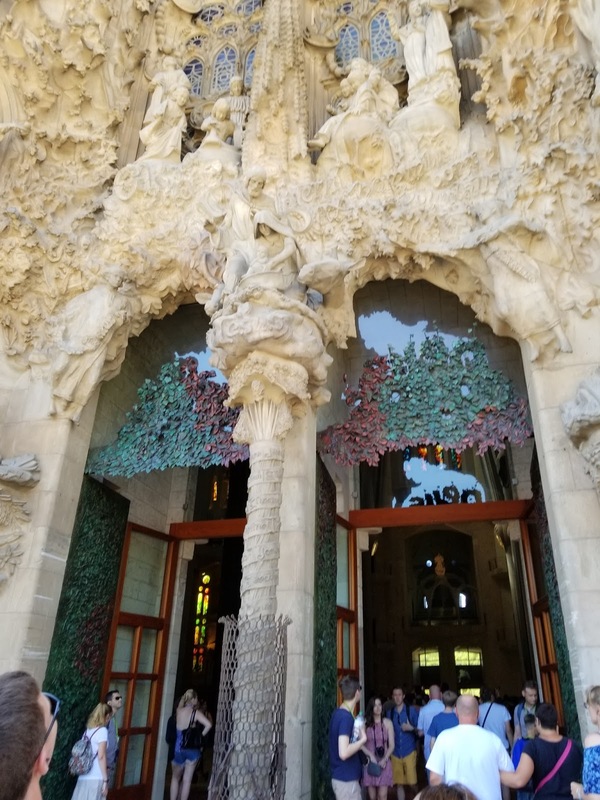 Gaudi's influence is pervasive to their culture. You cannot help but breathe deep and just soak it in, everywhere. 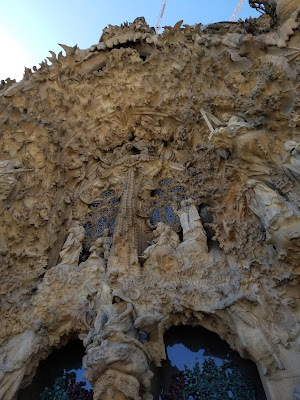 These are the spires of the church - if you buy an entrance ticket as we did, you can climb them, and see the details of the church from the outside, and it is nothing short of spectacular. On the top of each spire are these very modern clusters of tile-covered sculptures, some resembling fruit, others leaving their makeup to the imagination. The door has this sculpture all over it - likely out of copper or bronze. The ivy was incredible, but I just love the beetles! The real treat is when you go inside. 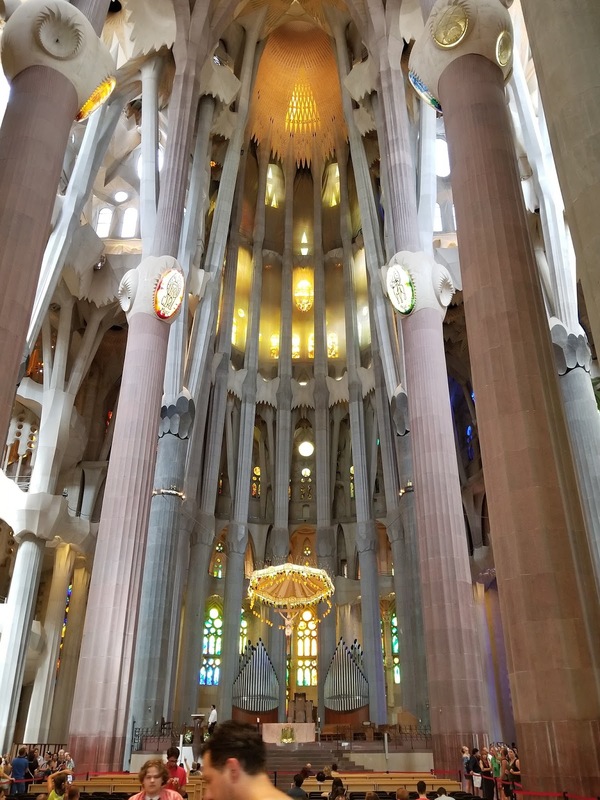 When many cathedrals are dark and somber, Familia Sagrada is anything but. It is bright, well lit and airy. The stone is a soft taupe, not the darker color I am so accustomed to seeing. There is just a modern simplicity to it, everywhere inside. But the windows are what blows you away. The glass has no discernible cut pattern like most leaded glass windows do. They are randomly cut, bright and glorious. Maybe this shows it better. I just love the windows. I make no claims to being religious. I don't go to church, nor will I ever. I did not have an epiphany when I went into this church; I just love the sense of peace it emanates. The color is beyond glorious. It is modern and yet it evokes a calming aura into the spirit of the least religious of people. Just look how bright it is inside. 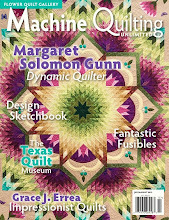 Anyways...what does this have to do with quilting?...I am sure you are wondering. Is I said a while back, we were in Barcelona 2 days before the deadly August Attacks. we walked on the very street where they happened, shopping for trinkets. Barcelona was a turning point for me. 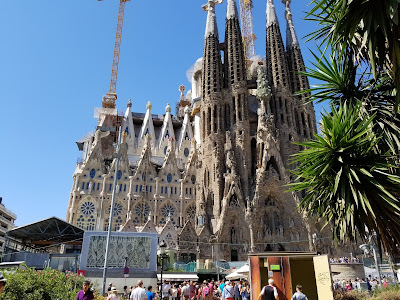 Having never wanting to go back to Spain for the past 30 years, after being mugged at 18, I now really want to go back. That is how delightful and moving Barcelona was. I knew when we left there I wanted to incorporate this passion into a quilt, somehow. 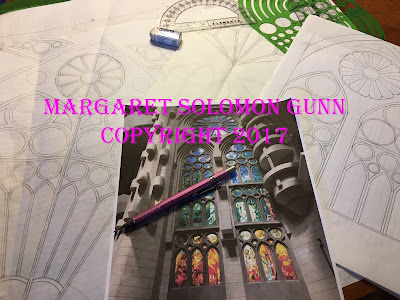 In the 2 months since the trip, I have diddled with designs, and then I sat down in earnest yesterday and really started drawing. It will have a lot of applique, and it will incorporate plenty of color. I also hope to use silks -- something I just cannot seem to avoid. Right now, I am fidgeting with the plan a little. The last thing I want is for it to come out looking like a giant bulls-eye -- not something I find remotely attractive in a quilt. I have pulled my scrap box of batiks and begun to soak them. Some years ago when I had bleeding issues, I swore off batiks, but I know in my heart that they have to be the windows. I may soak them for the next 2 weeks, but I will get the excess dye out! Two weeks ago I soaked some silk. These next photos show how much dye comes out of some fabrics. These were soaked in very hot water, and left for 2-3 hours. Even after 3 soaks, there was still pink coming out of this fabric! Well, the first round of batiks are in the sink upstairs now. The water drained was the color of prune juice! This will be a long process! and by jackpot, I meant to say that I have now chipped my way through a bunch of client quilts, and now am taking some time to work on one of my own projects! I have been quilting on this quilt since about March, but now is the time to seriously wrap this up! Let me show some of the things I have done the last couple of weeks. 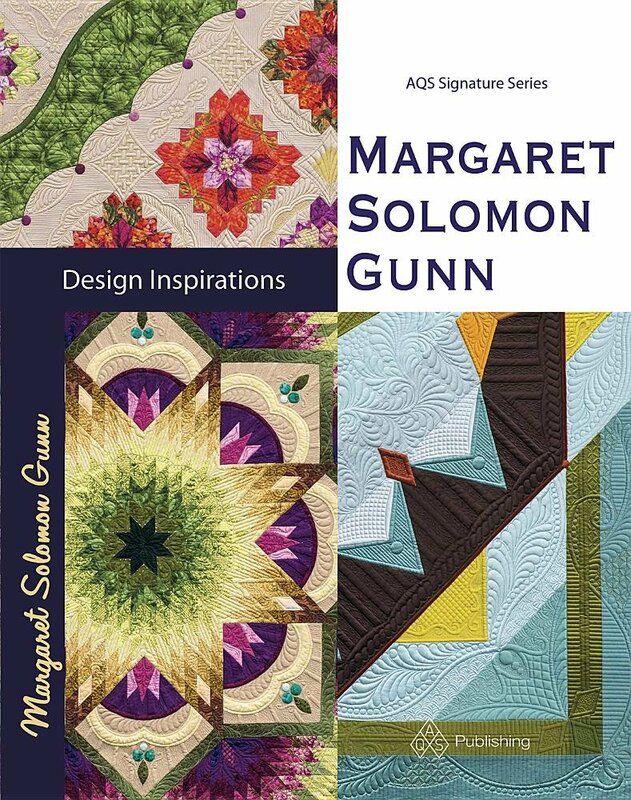 This quilt is very different for me, but Jean is a long time client of mine from CA, and despite it being outside my box (OK, it's outside the box, down the road, and over the cliff from my normal wheelhouse! ), I wanted to do my best to give "Katrina" what she deserved! This is an original design that the maker will be teaching soon. Here's a closeup... It was really kind of fun once I bot into the quilt. I double batted it with wool, and quilted it with Madiera Monolon clear nylon thread. The border has a taupe thread. The clear thread enabled me to go beside the embroidery and not have it show. Out on the ivory background, it just looks like ivory thread. I call this a win-win! On a separate note, keep my client Jean in your good thoughts. She is from Napa, and must be very nervous with the fires in that area of CA. I just cannot imagine. The next three are by a MA client. This is a beautiful baby quilt. It is so simple, yet so sweet. The quilting just brings it alive. Each heart block is quilted continuously with one start and stop. This includes the ditch stitching on the block, the applique and the feathering! All of Denise's quilts had blank white backings, to show off the quilting! She was on a heart-roll. There was a wall-hanging too. I double batted it with wool, and quilted with a 40wt Glide thread. Most is ivory, but there is also a gold used on the colored squares. She requested a simple custom. I finished her last quilt today - an easy edge-to-edge. The piecing is textbook flat, perfect borders. 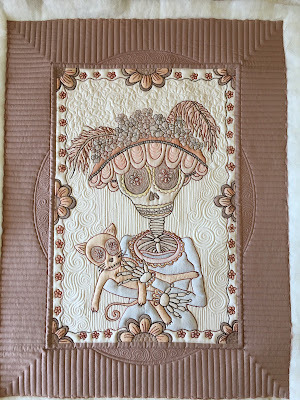 Her work is enjoyable to quilt because there are no issues. This has such lovely colors on the vintage reproduction fabrics. I am at a point where I am working on some of my own tasks. 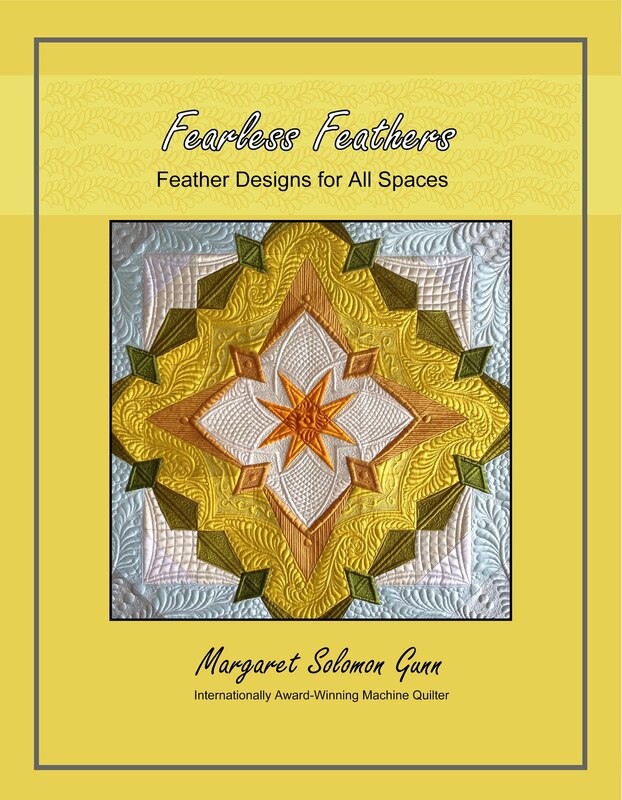 I do have a few openings, maybe a dozen, for edge-to-edge quilting between now and about December 10. They will be quilted before the holidays. Just email msolomo1@maine.rr.com if you want to secure one of these spots. I spent 5 days in Springfield, IL teaching 7 classes...6 hand's on and one lecture last week. While it is always tiring to be on the constant go, it is also always a great experience to be able to connect with other quilters. I love seeing the light bulbs go off. Here are a few shots of some of the classes I taught. A is for Applique is a 7 hr (all day) class in which I talk for a couple hours about techniques for quilt design as well as the nuances of quilting an applique quilt. The students plan a design for a simple top, and then get 4 hours to execute it. The pieces are all a bit different, as is their work. This is one of my favorites, and will be taught again in April 2018 at MQX East. 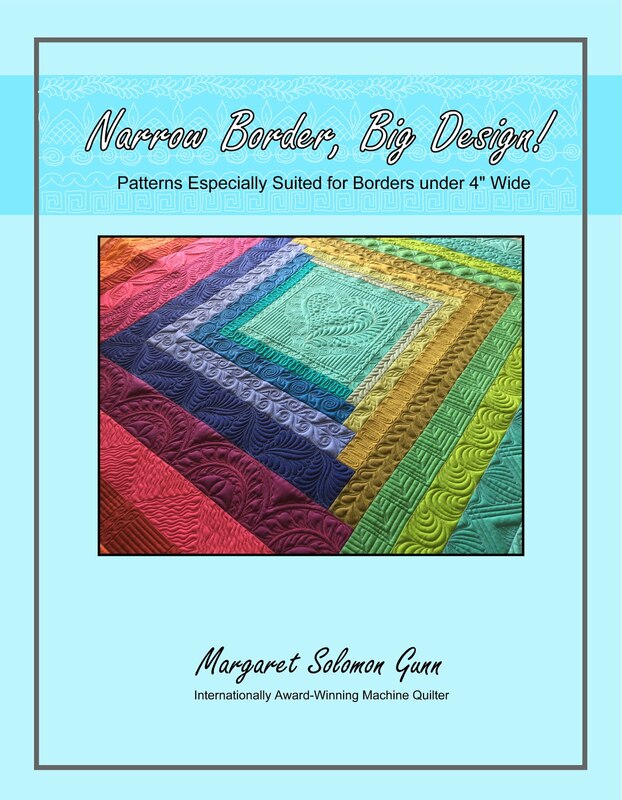 Narrow Border...Big Design teaches border designs for widths from 1/2" up to 3-4". It starts easier, and builds to more complex multi-step borders. They all did great! I have no photos from my Dense & Dainty Freehand fills class, but it and it's lecture companion class went well. 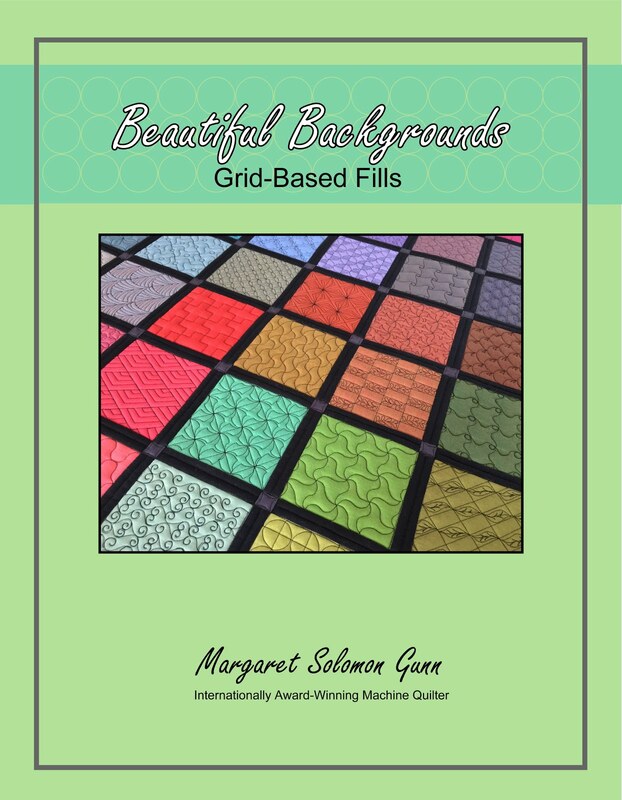 The next 2 photos are from Beautiful Backgrounds...Grid-Based Fills. I had 3 mostly full classes of this! THREE. It has been immensely popular the past 2 years. 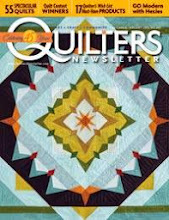 My quilters did super at these fills. Shots from the backside always show gorgeous texture! The last 3 classes all have a companion book which I sell on my website (see the blog sidebar). These books contain 4 to 5 times the content that I can possibly introduce in a 4-hr class. I brought LOTS of my books to MQX, and sold out by the middle of the 3rd day! I really underestimated how popular they'd be. So if you did not get one there, or want to order one...they are on my website. Unbeknownst to me, a client of mine entered a quilt which I had quilted earlier this year. And...> it won 1st place! 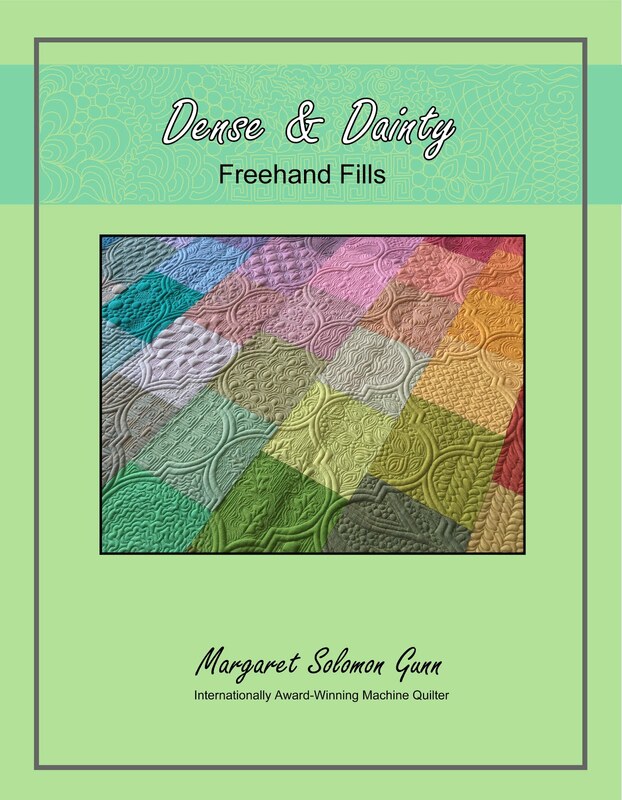 It's got a lovely selection of fabrics and embroideries. The added plus was getting to meet Tracy at the awards as the winning quilt was announced! I had 19 quilts on display at MQX in a retrospective exhibit. Except for Bouquet Royale which looks wretchedly wrinkled, they all looked great. This had to be shipped last minute, and looks like an elephant pressed the box. If by some fluke you are interested in purchasing one, please contact me directly. I am at the point where I am ready to entertain selling some. They will be also on display at the MQX East next April.